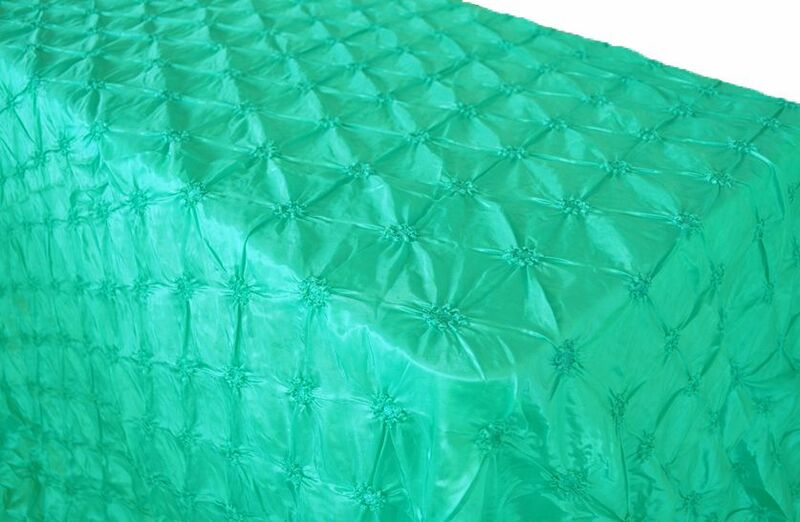 Tiff Blue / Aqua Blue Rectangular Pinwheel Taffeta Tablecloths 90x132Free Shipping over $150 - US 48 Contiguous States! $9.98 Flat Rate Under $150 - US 48 Contiguous States! Condition: Brand new rectangular pinwheel taffeta tablecloths, Rectangle pinch wheel banquet table cloth covers, oblong pinwheel taffeta table cover linens. Color: Tiff Blue / Aqua Blue. Uses: Rectangular pinwheel taffeta tablecloths use for oblong rectangle banquet tables, wedding, party, wedding reception, banquet hall, celebrations, restaurant, hotel and all special events. How to Care: Rectangular pinch wheel table covers can be machine wash in cold water. Machine dry at low temperature or Hang dry, and remove as soon as the cycle is complete, Remove promptly from drying cycle to avoid wrinkles, If ironing is needed, Use a moderately warm iron. Note: Price for rectangular pinched taffeta table linens only, other decorations are not included.